One day last year I went to lunch with the braintrust at Robot House Creative and we decided to dine at Chimex. Based on the name and the semi-racially insensitive artwork on the exterior, we were under the impression that Chimex was serving some sort of Chinese/Mexican fusion cuisine. The reality was much less impressive. Chimex serves mall food court quality Chinese food. The ownership and staff are Mexican. That’s it. Nothing too bad, but not nearly as inventive as we’d been hoping for. Turns out, we missed the mark by 15 miles or so, because what we sought has been on the menu since the beginning at Norman’s El Toro Chino. Spanish for “The Chinese Bull,” El Toro Chino is in a weird spot in north Norman. When I took a few friends who are familiar with the city to the restaurant, they were legitimately puzzled to find much of anything where the eatery is located. Which is to say, it’s easy to find. The food is a little harder to pin down. Latin cuisine is a very wide category and Asian cuisine even moreso. Roping in so many distinct flavors on one menu isn’t easy, but I think El Toro Chino threads the needle. My first trip to El Toro Chino included an order of fusion nachos ($11) and that was it. I was about to order more, but the waiter stopped me cold. “The, uh, the nachos are kind of a lot,” he said. Should I order something else? I inquired. No, he said. The nachos are by far the most popular item on the menu. But if you’re getting them, either share them with a large group or resign yourself to just eating the nachos. He brought me a smaller portion, but it was still massive. The base are fried wonton chips, which are extremely light, covered in so much food that it’s almost an O Henry story. Take a deep breath. Here we go. Skirt steak with hoisin marinade, black beans, spicy citrus sour cream, shredded cheese, onions, pico de gallo and sesame seeds. It’s comically large. The flavor is kind of crazy, simply because you’re presented with so many bold ingredients. The skirt steak is tasty and I love the sweet, savory flavor of hoisin, but it does take getting used to in this format. Remember, most Korean barbecue is eaten with rice and pickled vegetables. This is buffeted by sour cream and cheese, sweet caramelized onions and the mild flavor of fresh pico. Not quite as filling, but no less satisfying, are the carnitas eggrolls ($10). So far as the intersection of Asian and Latin cuisine goes, this was one of my favorites. 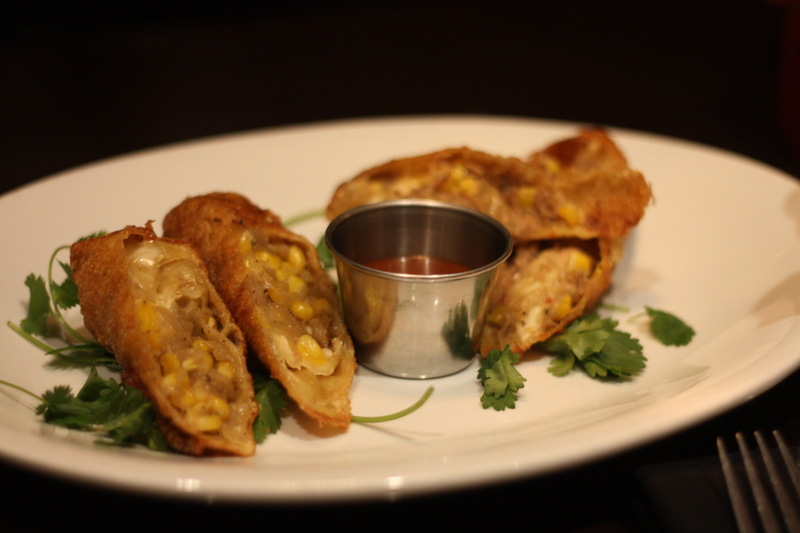 The pork carnitas, pepperjack cheese, onions and roasted corn make for a delicious southwest-style eggroll. But the addition of hoisin elevates it by adding a sweet component not usually found in this savory appetizer. That, more than anything, is the underlying tension at El Toro Chino. The line between savory Latin fare and sweeter Asian dishes creates an at-times odd pairing. It’s a credit to the restaurant that they’ve so successfully balanced the two. 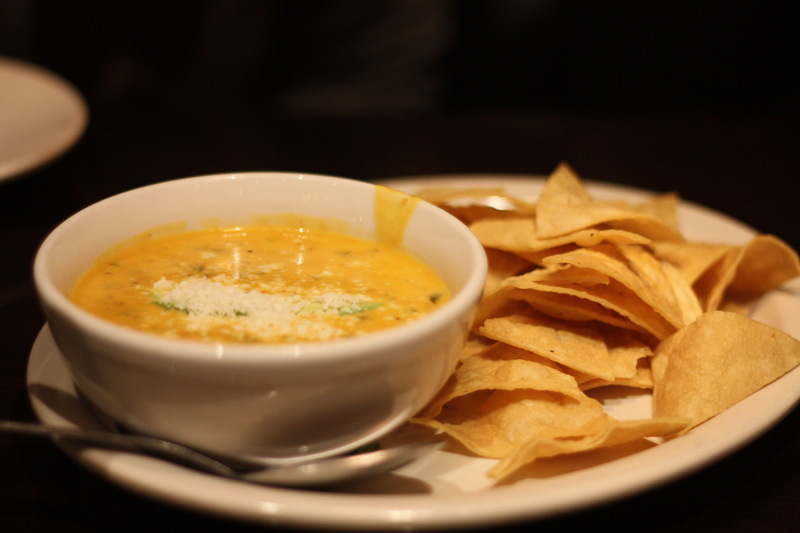 I wanted to like the chorizo queso ($7) more, but it lacked much of the chorizo flavor promised in the name. 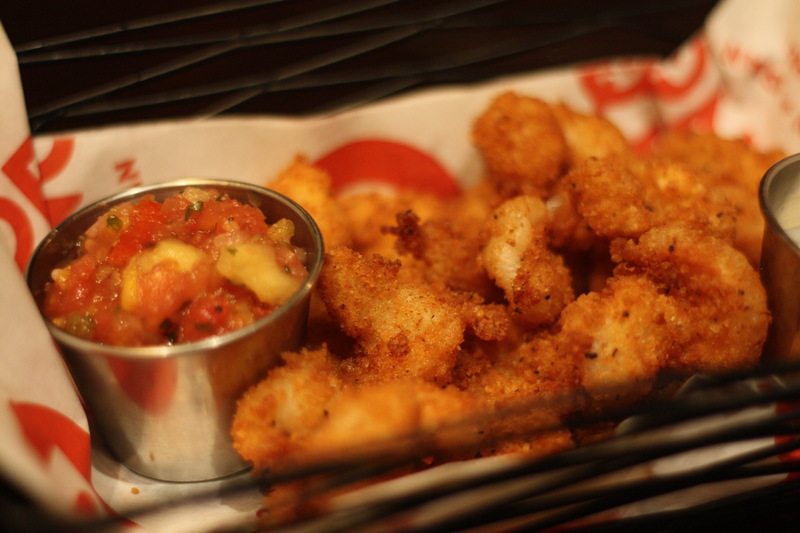 Much better were the crispy shrimp ($11), which quickly became a favorite of the table. Each bite-sized shrimp was covered in a salty, crunchy blend of panko and parmesan cheese and the pile of tender treats came with mango salsa and a spicy sour cream dip. Of the dips, I preferred the sour cream, but the shrimp really don’t need either of them. The umami flavor of the parmesan and the texture of the panko gave the mildly sweet shrimp an addictively poppable quality that made them dangerous. 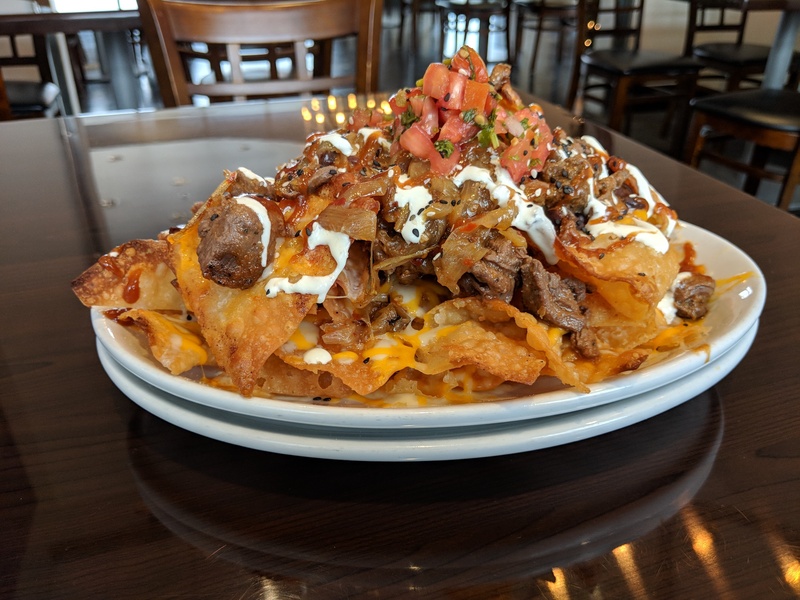 If you don’t want a pile of nachos for dinner, there’s something wrong with you. But if you insist on exploring the rest of the menu, all that missing chorizo flavor from the queso showed up in the grilled salmon ($19), which comes with a chorizo, chickpea and fennel succotash. 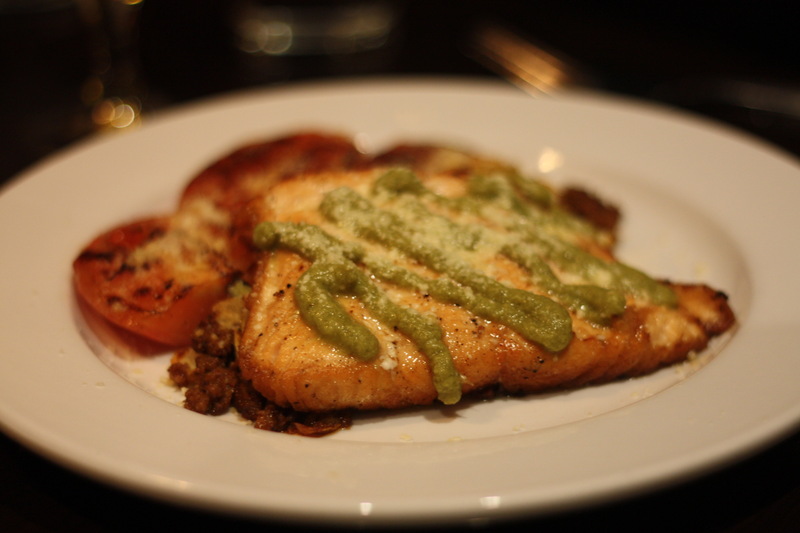 The salmon was cooked right, but the flavor definitely took a back seat to the succotash and ranchera sauce. The brown sugar and soy sauce marinated brisket ($19) was nice and tender. The sweet-savory balance was right on here, with just a hint of sugar in the caramelized crust. 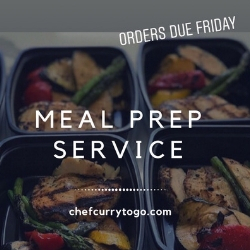 Use a deft hand with the cilantro-lime sauce, which could overpower the meat if used too heavily. The Spanish rice was nice, but I found the accompanying sauteed mushrooms and grilled tomato a little bland. That’s always a danger when sides go up against big flavors like soy sauce and cilantro. There’s always room for dessert and even if there isn’t, make room, because you shouldn’t leave without trying the churro bowl ($7). It’s a bowl. Made of churros. 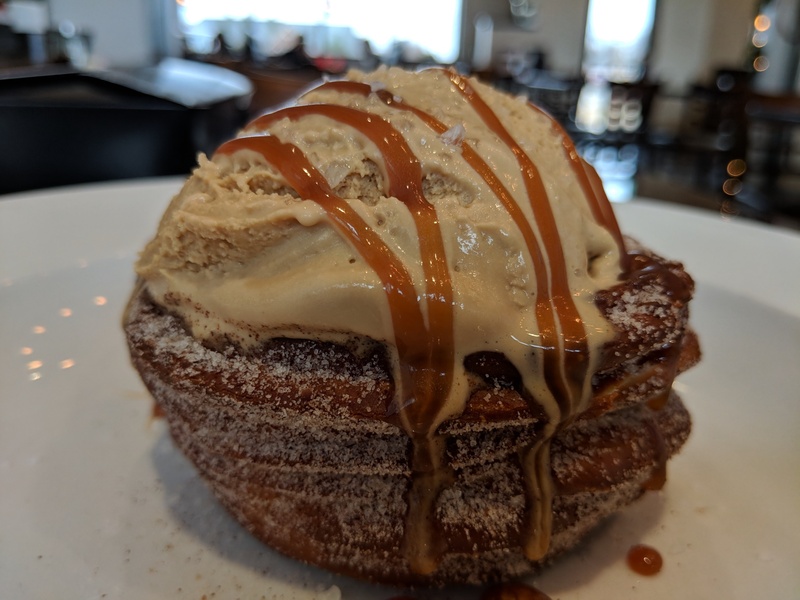 Filled with sea salt and caramel gelato. Not only does it look amazing, the heat of the churros plays off the cool, slow-melting gelato in a really delightful way. The interior of the churros remains creamy, but the exterior is fried to perfection. This has a little bit of everything and I want a lot bit more. We couldn’t resist trying the Mexican chocolate cake ($9) either. Look, I’m never mad at chocolate cake. Moist and fluffy, it’s almost always a great cap to the meal. Or a tasty breakfast. Look, you gotta live how you live. 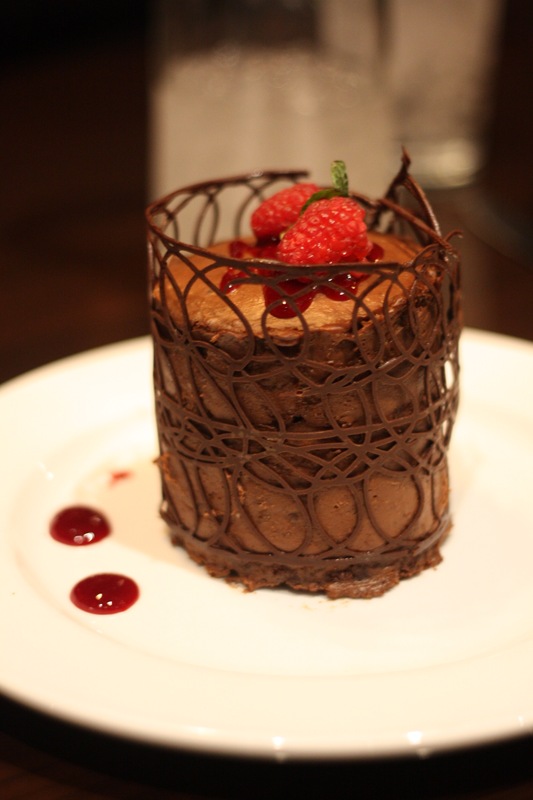 But El Toro Chino goes above and beyond with this cake, which has a chili-infused chocolate mousse between layers of chocolate cake. On top are raspberries, raspberry sauce and a bit of cinnamon-kissed whipped cream. Yowza. Let a bite sit for a few moments before you take another and give the chili a chance to breathe. You’ll feel heat spread across your palate before fading away. It’s a unique experience. I recommend you try it for yourself. I like El Toro Chino and I think I could love it someday. The restaurant is still young and the menu is still changing. But I get the feeling that it’s improving week by week. The fusion of these flavors is still new and interesting. With the right driving force in the kitchen, I think it’ll only get better. 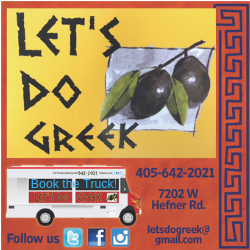 Mon - Thurs 11 a.m.-4 p.m., 5-9 p.m.
Fri - Sat 11 a.m.-4 p.m., 5-10 p.m.
Sun 10 a.m.-3 p.m., 5-9 p.m.